I don’t care what the calendar says. 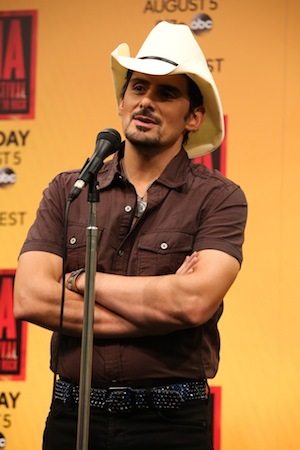 I know when summer arrives, and it ALWAYS occurs during the CMA Music Festival. This year, it was on Saturday (June 7), when the downtown temp hit 90, and a walk around the campus started to feel like a death march. I arrived later in the afternoon than usual. At Walk of Fame Park, Heath Humes & The High Dollars were romping through “Jambalaya.” The Chevy Roadhouse Stage in Fan Alley went silent at 3 p.m., but over at the Texas On Tour stage, Holly Tucker was in full voice, delivering her solid single “More Than Just a Word” and following it with a splendid version of the Hunter Hayes hit “Somebody’s Heartbreak.” She sounds like a comer. At Riverfront, Jason Michael Carroll was bringing his set to a spirited finale. Ella Mae Bowen and Caroline Cole were on tap in the Martin Guitar tent. They were between acts at the Bud Light Stage, but that venue had its weakest lineup of the fest on Saturday, in any case. Meanwhile, back at Walk of Fame Park, newcomer Cam was sounding winsome, hale and hearty. The Music City Psychic was doing steady business on Lower Broadway. Both guys and gals were trying their luck swinging a hammer down and trying to ring the bell on that vintage strength-test thingy. One new attraction is the Swamp People Gator Tag, which features a mechanical gator ride. Those wacky, protesting, Jesus people are back with their condemning signs and their bullhorn. The History Channel is promoting its Cross Country Cookout show by giving away yummy sausages on a stick. They weren’t free, but homemade lollipops were for sale to benefit “Suckers for Survivors.” This group supports a female cancer survivors convention. Up in the Music City Center, afternoon autographing artists included Wynonna, Taylor Lynch, Frankie Ballard, Chip Esten of the Nashville TV drama, Kix Brooks, Rachele Lynae, Brett Eldredge, Austin Webb and living legend Brenda Lee. There has to be some kind of “Best Costume” award for that guy with long orange hair who bills himself as 8 Ball Aitken. His fully-floral, multi-colored suit topped with a cowboy hat was a brave fashion statement. Everyone loved posing for photos with the Chicken of the Sea mermaid in her sparkly, shiny tail. Missing in action was Lynn Anderson. She had planned to autograph on Saturday, but called in sick. This breaks her attendance record as the only country star who has been in her booth for the fans at every single Fan Fair/CMA Music Festival since it began in 1972. At the AT&T U-Verse Showcase Stage, the female trio The Shuggah Pies was harmonizing sweetly. Blue Mother Tupelo wailed on the Durango Stage. That morning at Greer Stadium, the annual Celebrity Softball Game was staged for charity (City of Hope). It was batter-up for Scotty McCreery, Jana Kramer, Chuck Wicks, Lauren Alaina, Florida Georgia Line, Jamie Lynn Spears, Chase Rice, Sarah Darling, Dee Jay Silver and Danielle Bradbery, among others. Team Opry, “coached” by Pete Fisher prevailed over Team iHeart Radio, led by Bobby Bones, 13-11. Approximately $200,000 was raised. The morning sunshine was long forgotten by dusk. A thunderstorm arrived at 6:45 p.m. Confident that it would blow over, we headed for LP Field anyhow. The thunder left, but the rain didn’t. Fans huddled in the bowels of the stadium until dribbling into their seats around 7:55. It continued to rain steadily. Nashville Mayor Karl Dean asked for applause for both the artists and their soaking, dedicated fans. The relentless rain continued. Home Free, the country a cappella group who won on last year’s The Sing Off, sang the national anthem with a super-imaginative arrangement. 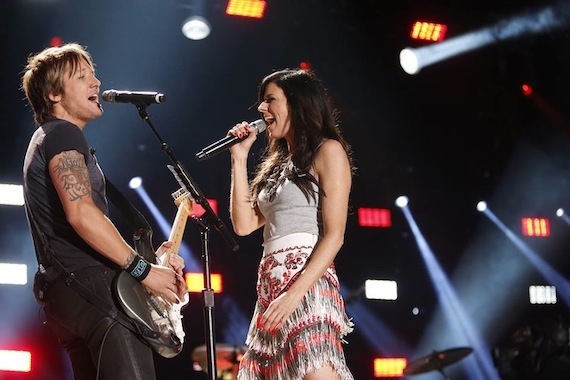 Sara Evans finally kicked the music off at 9:25 p.m. with “Born to Fly.” Little Big Town hit the stage with their white-hot soul vocals burning brightly. It was still raining. Fans sang along with Darius Rucker’s “Come Back Song.” Florida Georgia Line did their thing, by which time the rain had ceased. Closing the show late, late at night was Keith Urban, I assume. (We were home, in our pajamas and headed for bed by then). Chris Young had surgery on that hand he sliced Thursday night and had to cancel. Industry fabulons spotted Saturday included Victoria Shaw, Larry McCormick, Cindy Watts, Dennis Banka, Michael Knox, Mark Zaleski and handsome young record maker Justin Adams. The last day of the festival always brings me a twinge of sadness. It’s like the circus has come to town and is now folding up its tents. But there were two big pluses about the events on Sunday (June 8). First, the day had the best weather of the fest. Second, I heard some of the best music on that day. It started at Riverfront, where Lonestar turned in an outstanding set, climaxing with “Amazed” at 2 p.m. Grits & Glamor (Lorrie Morgan & Pam Tillis) were up next. They were introduced as, “two of the finest singers in the world” and then proved it. They alternated between Pam hits (“Shake the Sugar Tree,” “Maybe it Was Memphis,” etc.) and Lorrie hits (“Go Away,” “Something in Red,” etc.) and added duets to the mix, such as the stirring “I Am a Woman.” They also did a killer, rocking duet version of Joni Mitchell’s “Clouds.” It was a stunning presentation by a pair of true pros. “This is the best weather we’ve ever had,” marveled Pam backstage. “It’s borderline cool.” The temperature never even hit 80 that afternoon. It seems there was good music wherever I turned that day. Jamie Lynn Spears was on the Bud Light Stage. With “Shotgun Wedding” and other tunes, she proved that she is more than Britney’s kid sister and that she means business as a Country singer. At the Hard Rock, Gunnar & The Grizzly Boys rocked smartly. Julie Roberts belted her tunes at the Samsung Galaxy Stage. The Buckle Stage had smooth-singing Josh London, promising songwriter David Ray and “heart” vocalist Daisy Mallory, among others. The HGTV venue The Lodge in Fan Alley featured such topnotch acts as Love & Theft, Jon Pardi, Striking Matches and Gloriana. Other outstanding talents booked for Sunday included David Nail, Natalie Stovall & The Drive, James House, Sweethearts of the Rodeo, Mandy Barnett, Laura Bell Bundy, Sundy Best and those a cappella wonders, Home Free. The revelation of the day was The Brothers Osborne at the stage on the plaza of the Country Music Hall of Fame & Museum. For these guys, stardom is just around the corner. Among the outdoor amusements, I noted the unusual combo of the furry blue Cookie Monster posing with fans alongside the Papa John’s Pizza Slice (someone in an orange triangle covered with felt pepperoni and other faux toppings). Fans displayed their good taste by forming a long lunchtime line outside Jack’s Bar-B-Que. Merry fans were posing with the Geiko gecko while an airplane circled overhead towing a “Get Down Texas” banner. The number of scenic river boaters had increased to more than 15. As the afternoon wound down, we headed for Fan Fair X. Nu Blu was wafting bluegrass beautifully from the AT&T U-Verse Showcase Stage in the convention hall. We need more harmonizing bluegrass bands at this fest! It was “boujour tristesse” as the Durango Stage went dark. By 3:30 p.m., the finale autographers in the hall included Mark Wills, American Young, Dan + Shay, Mitch Goudy, Tim Sweeney, Brandi Nicole, Sherry Lynn and Spears, as well as the tireless Kix Brooks and Ashton Shepherd. The balmy weather continued at LP Field that evening. 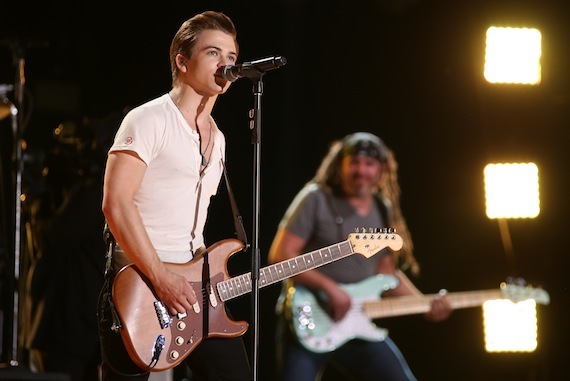 Hunter Hayes, The Zac Brown Band and Brad Paisley brought the 2014 CMA Music Festival to a close, with opening sets by The Charlie Daniels Band, Thomas Rhett and Lady Antebellum. Back at home, I reflected on the industry friends I’d encountered that day, including Justin Levenson, Tony Conway, Jeff Walker, Jon Walker, David Ross, Rick Murray and Stuart Dill. I recalled how sweet and gracious Nashville TV stars Sam Palladio (“Gunnar”) and Chaley Rose (“Zoe”) were when they were stopped by enthusiastic fans the moment they arrived at the gate leading to the corporate suites. ASCAP’s Michael Martin and LeAnn Phelan were in the CMA Hospitality Suite. It tickled me to introduce LeAnn to Jo Walker-Meador, the Country Music Hall of Fame member who was the founding director of the CMA. I prompted Jo to recall the first Fan Fair, staged in 1972 at Municipal Auditorium and attended by 5,000. “We had to bring down soldiers from Fort Campbell to fill up the seats,” she reminisced. “We were afraid the artists wouldn’t sing if we didn’t have somebody for them to sing to!” LeAnn asked her about the throng outside the suite’s windows at LP Field. “It’s always amazing,” Jo replied. It certainly is. 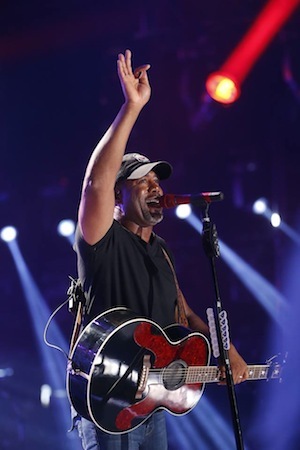 CMA Music Festival (the 2004 re-branding of Fan Fair) now has more than 60-national corporate sponsors, more than 500-performers and attendees from all 50-states and 24-foreign nations. Its 100,000+ attendees have a $30+ million direct impact on the Nashville economy. The fab grand finale fireworks display was at midnight.